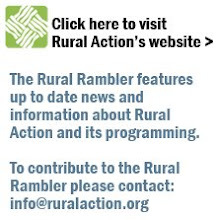 The Rural Rambler: Earth Month Panel Discussion: "Is Ohio Food Policy Sustainable?" Earth Month Panel Discussion: "Is Ohio Food Policy Sustainable?" As part of Ohio University's Earth Month 2010 program, a panel discussion will be held at 6:30p.m. in Bentley Hall, Rm. 136 on Wednesday, April 21st. The discussion is entitled, "Is Ohio Food Policy Sustainable?" This event is free and open to the public. Discussion topics will include a range of current agricultural issues, touching on livestock care standards, agricultural pollution, public interest in raw, organic, and local foods, as well as enhancing school lunch programs with fresh local ingredients, and more. - Warren Taylor, owner of Snowville Creamery, Pomeroy Ohio.